This week is when the weather finally turns warm in Israel, inviting families on Passover vacation to fire up their grills outdoors. You can hardly walk through a public park without skirting families unpacking picnics, fanning charcoals, and chasing runaway toddlers. And chicken wings are a favorite on these picnics, being easy to cook and so easy to eat. (If you prefer to enjoy your warm-weather meal at home, cook up Kabsa, our prize chicken and rice recipe). 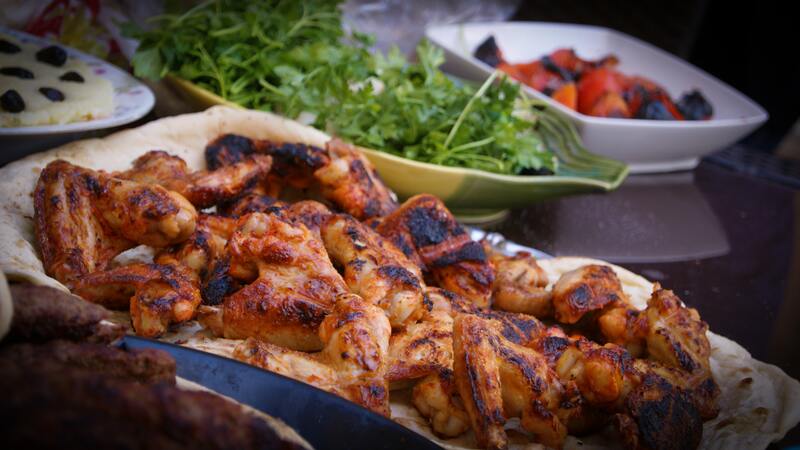 Here’s a recipe for grilled chicken wings that’s mildly spicy and pops with flavor. You do need time to marinate the wings before setting them on the grill, so plan ahead. Optional for people who like it hot: 2 hot red chillies, blended with the rest of the seasonings. Chop the garlic. Place it, with all the rest of the ingredients, in a blender and whizz to make a runny paste. Put the wings in a large bowl or bag with a seal. Add the blended seasonings. Either massage the seasonings into the wings, if storing them in a bowl, or close the bag and shake it well to season all the wings. Refrigerate the wings from 12 hours to 2 days. Allow the wings to stand at room temperature for 1/2 hour before grilling. Grill 15-20 minutes, brushing with the seasonings often. For safety, don’t brush the wings with the seasonings for the last five minutes of grilling. This allows the last brushing to cook through. Discard the leftover seasoning; do not use a second time. Eat the wings hot, and lick your fingers.